If you have a severely damaged tooth, whether due to trauma, decay, or infection, your dentist in West Mobile will likely recommend that you have a root canal to save it from needing to be extracted. Although 15 million are performed each year, they are only used when there are no other viable options to save a tooth. Generally, they offer a 85% to 97% success rate; however, they can fail. To promote the long-term viability of the treatment, there are some key steps you can take at home. A root canal is an endodontic procedure that removes any areas of damage from a tooth. In addition, the pulp is extracted to restore its health. It is then sterilized and sealed using a special material known as gutta-percha. To improve its function and appearance, a custom-made dental crown is placed over it. Most often, the cause of a failed root canal is due to reinfection. This can be due to poor dental hygiene after the procedure, a break or fracture in the crown, or improper sterilization prior to sealing the tooth. They can also fail due to unfilled canals, missed canals, cracks in the root, poor interior sealing, or too much sealing. How Do I Know If My Root Canal Fails? A successful root canal should not cause any pain or discomfort. 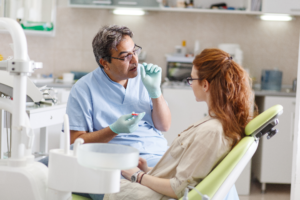 If you notice changes, such as tenderness, swelling, or an abscess, it is often in indicator that there is a problem that needs immediate care from your dentist. The symptoms can appear suddenly or intermittently. Even with the symptoms, that does not necessarily mean that the root canal is failing. You will require a comprehensive consultation from your dentist to pinpoint the cause of your discomfort. How Can I Prevent Root Canal Failure? To ensure the long-term success of your procedure, choose a dentist who is experience and qualified in the treatment to perform it correctly. Afterward, practice proper oral hygiene habits at home. Brush your teeth twice a day and floss every night before going to bed. Pay extra attention when cleaning around the gum line near the crown to remove any plaque or bacteria. In addition, do not forget to visit your dentist twice a year for a cleaning and checkup. During your examination, they can help spot any early warning signs that there may be an issue brewing with the tooth. If you have a severely damaged tooth, do not have it extracted. It can be saved with a root canal. Choose a qualified and trusted dentist to restore your smile. Dr. L. King Scott provides family dentistry to the community. In addition to earning his Doctor of Dental Surgery, he has also completed thousands of hours of continued education to offer an array of specialized procedures, including root canals. If you need a root canal or suspect that you have one that is failing, contact our office today to schedule a consultation.